This past Wednesday, my boyfriend and I decided to visit a couple of local vintage shops and also try for the first time a restaurant in Jamestown, NC (neighbor city) named Southern Roots, and for the occasion I decided to wear a bohemian polished look. 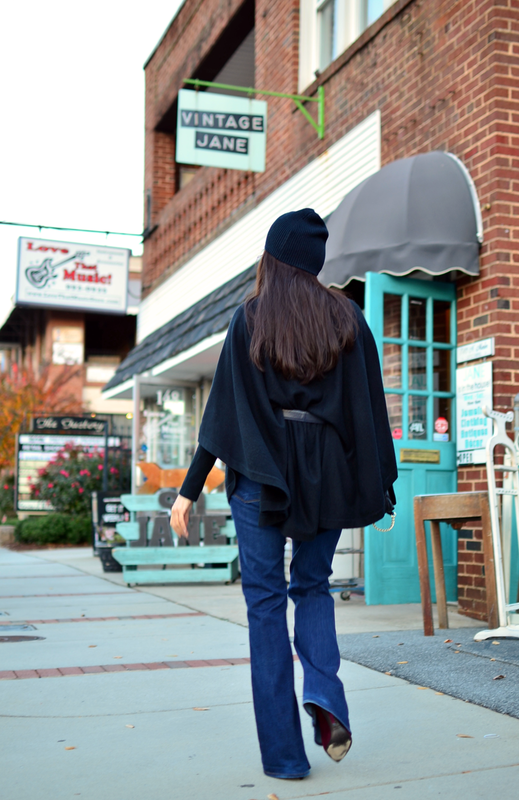 In order to accomplish this style the first thing that came to my mind was a pair of flared jeans (thank goodness they are trending again…my hips are loving it), then immediately after, I thought about pairing them with my old and faithful cashmere poncho and a vintage belt. I completed the look with a couple more accessories and voilà. El miércoles pasado, mi novio y yo decidimos visitar un par de tiendas locales de época y también visitar por primera vez un restaurante en Jamestown, NC (pueblo vecino) llamado Southern Roots , y para la ocasión me dio ganas de ponerme un estilo pulido pero con un aire bohemio. La primera cosa que vino a mi mente fue un par de jeans acampanados (en hora buena que se pusieron de moda otra vez … mis caderas lo agradecen) entonces inmediatamente después pensé en mi poncho viejo de cachemira. Bueno, luego me puse unos cuantos accesorios y voilà. Pumps/Tacones: Stuart Weitzman. Available here. Sunglasses/Gafas: Ray-Ban. Very similar here. This is my favorite look Carelia! 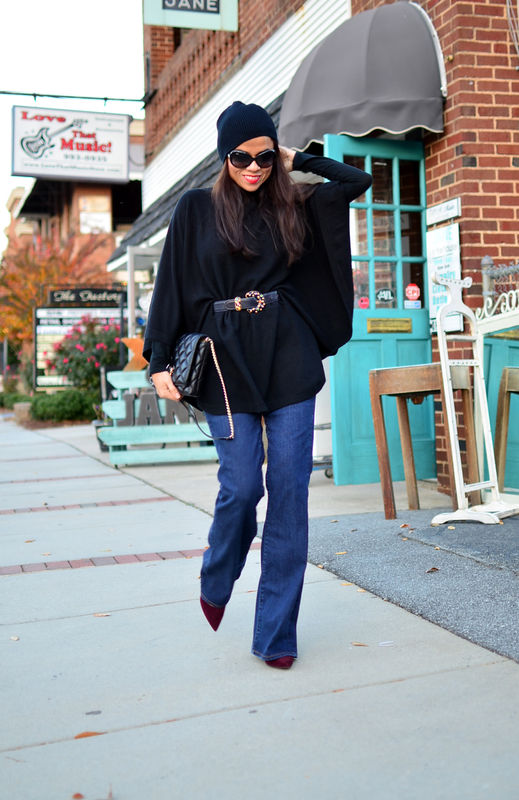 Those jeans make your legs look sooooo long! I love everything about this look. Just gorgeous and classic. Thanks so much!! 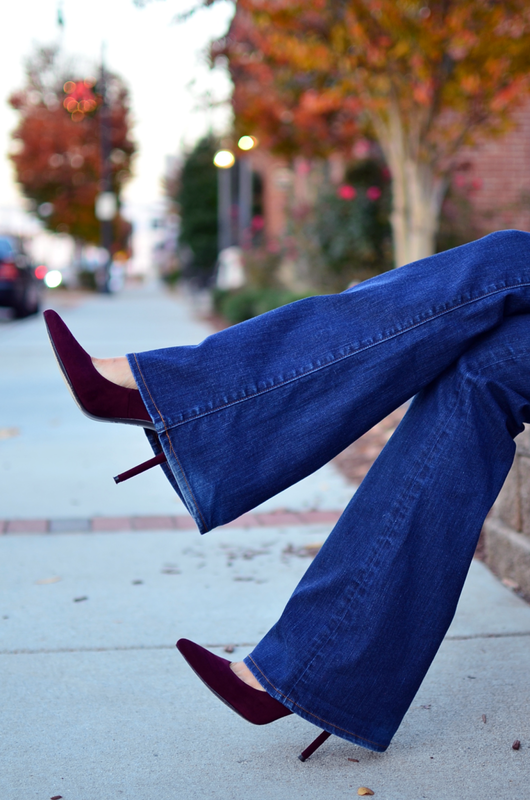 I always loved the way flare jeans make legs look longer ;-) reason why I never stop wearing them. 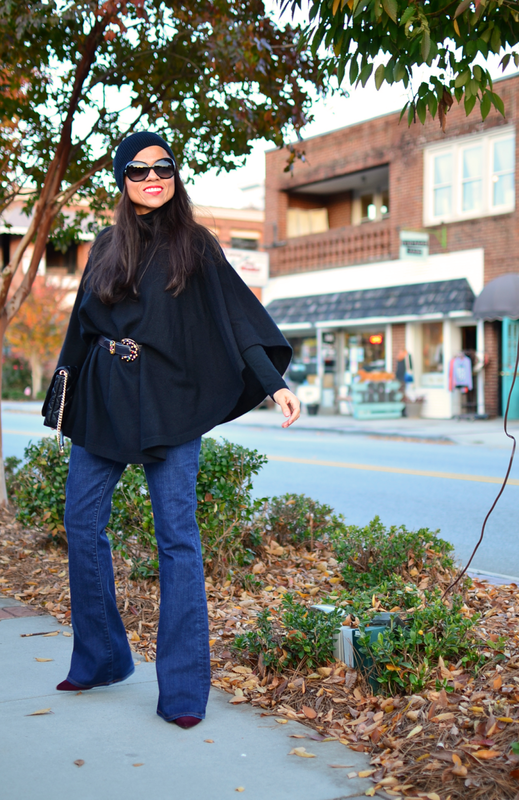 What cool look, love that poncho! This is a terrific look! I love everything about it. 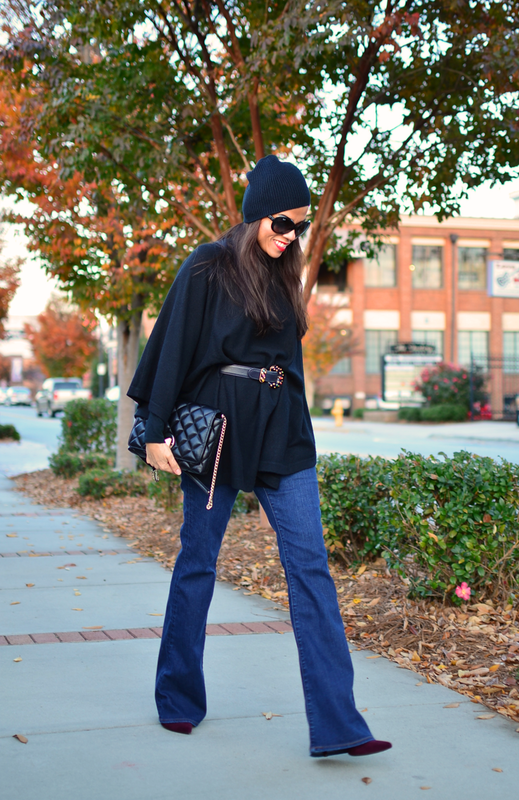 the flared jeans is so chic with pumps! Thanks Carolyn! and I agree, they are great combo.